Posted June 6, 2014 by Kristen & filed under Guest Blogger. There isn’t much I can say about these blondies, except that they rock. I cannot stress enough how easy they are, even if you do them from scratch (but if you visit my blog you can find a way to make them from a standard blondie mix also, if you’re feeling SUPER lazy). 1 Preheat the oven to 350°F. Whisk together the melted butter and sugar in a bowl. 2 Add the tofu, flax egg, and vanilla extract and whisk. 3 Add the flour, baking soda, baking powder, and salt, mix it all together. Add the candy mix-ins. Do you want 7 Go Max Go chocolate candy bars (one of each flavor)? Enter our awesome giveaway for a chance to win! This giveaway is open to everyone and we will pick 2 lucky winners on Monday night. We are giving you multiple entry options so you have more chances to win. On Tuesday we will announce the winners on GoMaxGo Facebook!! To enter this giveaway, comment on the GoMaxGo Facebook page with the secret word (okay 2 words), “Peanut Butter.” You can make up to 1 extra entry per social media post per day. You can tag @GoMaxGoFoods and @theveganweirdos in your tweets and #theveganweirdosnextdoor, and #gomaxgo on your Pinterest posts, as well as on Facebook. Posted May 16, 2014 by Kristen & filed under Guest Blogger. First and foremost, let me preface this recipe by saying that I did not come up with the name, in case you did not watch the popular sitcom, How I Met Your Mother. If you did watch, you know that Lily meets “the mother” on a train and she has a tin of these cookies. When I saw them, I knew instantly that I could veganize them. Being that there is caramel in them I had a choice- make caramel or hit my secret stash of candy bars. Confession. I pretty much always have a candy bar hiding somewhere. I think I get that from my mother. She used to tease me about being able to sniff out the chocolate. I found candy bars in her underwear drawer. Hey, when you need chocolate, you just need it. So I ate chocolate that laid with my mom’s undies. Sue me. At least my candy bars are vegan and do not mingle with my thongs. Not yet at least. When Leah starts to sniff out my chocolate, I suppose I will have to get just as creative as my mom did. 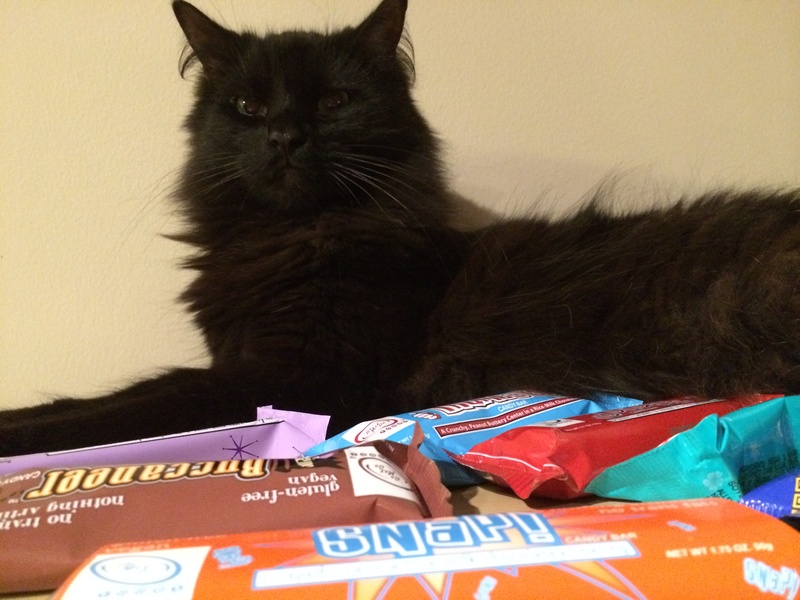 Because these candy bars are not for sharing. These are all vegan, ethically sourced, non GMO candy bars made to taste like popular candy bars. The Twilight is like a Milky Way, The Jokerz is like a Snickers, Snap! – well that’s like a Nestle Crunch Bar. Cleo’s are better than a Reese’s Peanut Butter Cup. Mahalo (my favorite) are a vegan Almond Joy. The Buccaneer is a better version of a Three Musketeers, and finally, the Thumbs Up is a tastier version of a Butterfinger. If you can’t find them at a local store, you can order them online at many vegan websites. Personally, I can find Jokerz, Twilight, and Mahalo at my local Whole Foods, and I bet yours would carry them if you bugged them enough, too. 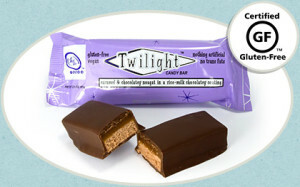 So get your hands on some Twilight bars (and some others for posterity or secret stash, and get to baking! Prepare a flax egg. Set aside to “gel.” (If you need tips on how to make it, you can visit my blog for a video, you can also visit for detailed preparation photos). 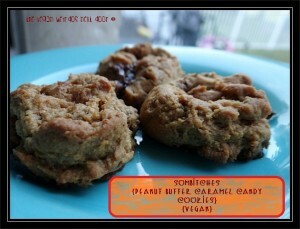 Cream together vegan butter, applesauce, and coconut palm sugar. Add maple syrup and stevia. Add peanut butter and whip until creamy. Mix flour, salt, and baking soda in a small bowl. If you’re smart, you will add this slowly. I got impatient and ended up with some flour on my shirt. And counter. No biggie. Don’t be like me. Chop your candy into tiny squares, and once everything is well combined, fold in chopped candy pieces. Chill dough one hour (or more). Line your cookie sheet with parchment or a silpat/silicone mat. Once you’ve cookie scooped your dough out, you can push the dough down with a fork, your fingers, or leave it puffy. Your call. Either way, just make sure there are no major pieces of candy sticking out anywhere. They will melt. All over your cookie sheet. Note: I like to chill my dough for at least an hour, but if you can’t wait, that’s fine. But the candy will melt pretty quickly so beware. The cookies will taste amazing no matter what, but your cookie sheet could get messy. Like mine did. You could also toss the candy bars into the freezer to firm up, which would help prevent the gooey mess. Bake for about 15 minutes on 350°F. 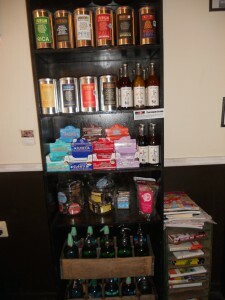 Do you want 7 Go Max Go chocolate candy bars (one of each flavor) & a tube of the fabulous vegan lip butter from Ellovi? Enter our awesome giveaway for a chance to win! This giveaway is open to everyone and we will pick 2 lucky winners on Monday night. We are giving you multiple entry options so you have more chances to win. On Tuesday we will announce the winners on GoMaxGo Facebook!! To enter this giveaway, comment on the GoMaxGo Facebook page with the secret word, “Weirdos.” You can make up to 1 extra entry per social media post per day. You can tag @GoMaxGoFoods and @theveganweirdos in your tweets and #theveganweirdosnextdoor, and #gomaxgo on your Pinterest posts, as well as on Facebook. Posted April 29, 2014 by Elisabeth & filed under Uncategorized. Happy Tuesday! If you entered our Friday giveaway, you must be wondering now if you won. Once again, I used www.random.org (random comment numbers generator) to pick this week’s winners. The first winner is a comment number 25 (Carmella). Congratulations, Carmella! Please email us your full name and address so we can ship you your sweet prize ( info@gomaxgofoods.com ). And the second winner is a comment number 30 (Kathryn B). Congratulations, Kathryn B! Please, email us your full name and address so we can ship you your bars ( info@gomaxgofoods.com ). Posted April 25, 2014 by Elisabeth & filed under Uncategorized. The spring is officially here 🙂 Who loves the warmer, longer days? Living in Atlanta, we go straight from winter into summer so I am always looking for cooling, refreshing and satisfying treats. 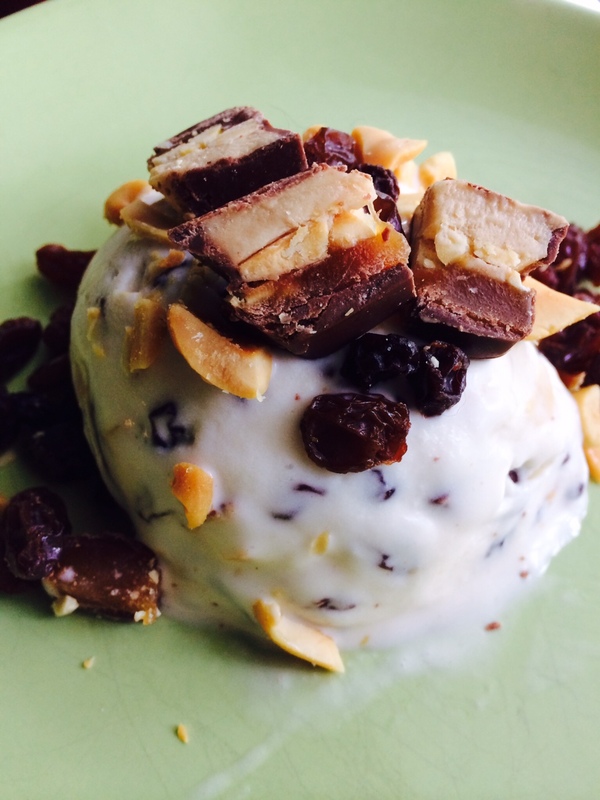 Here is one of my easy, sweet creations that you can make almost anywhere. 2 Go Max Go Jokerz bars, cut into small pieces. Optional: 2 Tbs chocolate chips, 1/4 cup shredded coconut, 2 Tbs pumpkin seeds, 1/4 cup pistachios, or 1/4 cup crushed pretzels. Mix slightly melted ice cream with the rest of the ingredients. Freeze for half and hour or until firm. Scoop into bowls or onto plates and enjoy! Do you want 7 Go Max Go chocolate candy bars (one of each flavor)? Enter our awesome giveaway for a chance to win! This giveaway is open to everyone and we will pick 2 lucky winners on Monday night. We are giving you multiple entry options so you have more chances to win. On Tuesday we will announce the winners here on the blog, so stay tuned and check back here to see if you won. To enter this giveaway, comment bellow what was your reason for going vegan or vegetarian, or if you would ever consider becoming vegan or vegetarian? For additional entries, post a link to this giveaway on Twitter, Facebook, your blog or Instagram, then comment bellow with a link to your post. You can do up to 1 extra entry per social media post per day. You can tag @GoMaxGoFoods and @CzechVegan in your tweets. Posted April 1, 2014 by Elisabeth & filed under Uncategorized. Happy Tuesday! Did you enter our sweet giveaway? Today I picked two random winners who will receive 7 Go Max Go candy bars each. I am thrilled that Go Max Go bars are available in USA, Australia and Europe and can be ordered online so everyone can enjoy them. I love finding new places that sell my favorite vegan candy bars. 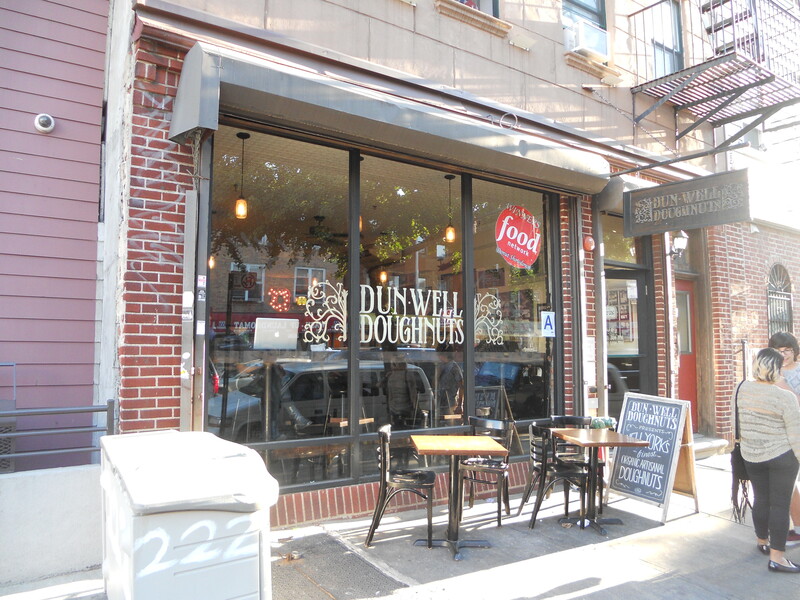 One of my newest sweet discoveries was an all vegan artisan donut bakery “Dun-Well Doughnuts” www.dunwelldoughnuts.com in Brooklyn, New York. And now the winners! I used www.random.org to pick today’s winning comments. First winner is a comment #49 (Sarah Kresol’s comment). Congratulations, Sarah! Please, email us at info@gomaxgofoods.com with your address so we can ship you your bars. And the second winner is a comment #63 (Kelly Z’s comment). Congratulations, Kelly! Please, email us at info@gomaxgofoods.com with your full name and shipping address so we can ship you your bars. Posted March 28, 2014 by Elisabeth & filed under Uncategorized. Good Morning! Do you have a canine companion or any friends who have doggies? Do you ever share your food with your pooch? My sweet girl Shelly loves all kinds of vegetables and fruits (everything from banana, carrots, cucumbers, bell peppers, to blueberries). She would like just about anything that I eat, but unfortunately there are certain things she cannot eat due to allergies. Also, some foods are toxic or dangerous for dogs. One of those things is chocolate. 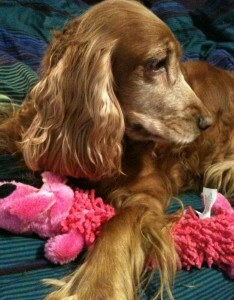 If I could, I would share my Go Max Go candy bars with Shelly, but chocolate is very bad for dogs. Since I love candy bars and love spoiling my little girl, I decided to create a doggie friendly Go Max Go Mahalo and Jokerz bars treats. These are beautiful, easy to make (no bake), and delicious (yes, you can enjoy them with your doggie). They will keep in the fridge for about a week, but you can freeze them to extend their freshness. If you freeze them, defrost them at a room temperature before serving. You can add some oats, mashed chickpeas, shredded carrots, or pureed pumpkin, or other ingredients that you like. I made these for dogs with allergies and sensitivities to grains, but they will make any dog happy. Let’s make some truffles! Place almonds, dates, and carob powder into a food processor and blend until they form a thick paste. Add water or almond milk if the batter is too thick. Remove mixture from food processor and place into a medium size bowl. Stir in 1 cup shredded coconut and blend until well incorporated. You can add more water or milk if the mixture is too thick. Refrigerate the dough for about 20-30 minutes. 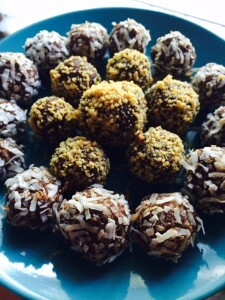 Form small truffles (balls) between your hands. Place 1/2 cup shredded coconut into a small bowl. 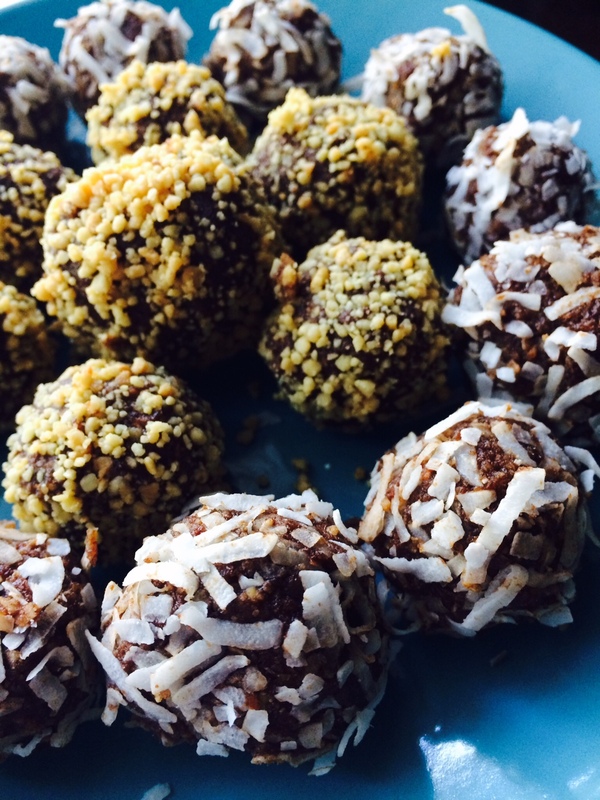 Roll each truffle in the coconut and set aside. Place peanuts, dates, peanut butter and carob powder into a food processor and blend until they form a thick paste. Add water or almond milk if the batter is too thick. Remove mixture from food processor and place into a medium size bowl. Refrigerate the dough for about 20-30 minutes. Form small truffles (balls) between your hands. Place 1/3 cup finely chopped peanuts into a small bowl. Roll each truffle in the chopped peanuts and set aside. 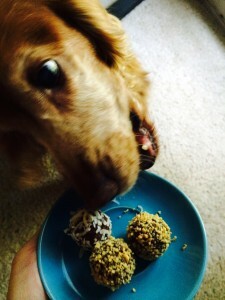 If you dog does not want to share these yummy truffles with you, try your luck in our giveaway, and maybe you can win 7 Go Max Go chocolate candy bars for yourself. This giveaway is open to everyone and we will pick 2 lucky winners. We are giving you multiple entry options so you have more chances to win. We will pick two random comments on Monday night. On Tuesday we will announce the winners here on the blog, so stay tuned and check back here to see if you won. To enter this giveaway, comment bellow what candy bar would you like to see veganized, or what is your favorite Go Max Go candy bar? For additional entries, post a link to this giveaway on Twitter, Facebook, your blog or Instagram, then comment bellow with a link to your post. You can do up to 1 extra entry per social media post per day. You can tag @GoMaxGoFoods and @CzechVegan in your tweets. Posted March 25, 2014 by Elisabeth & filed under Uncategorized. Happy Tuesday! I hope you are having a purrfect day so far! My name is Bear and I am one of Elisabeth’s furry kids. 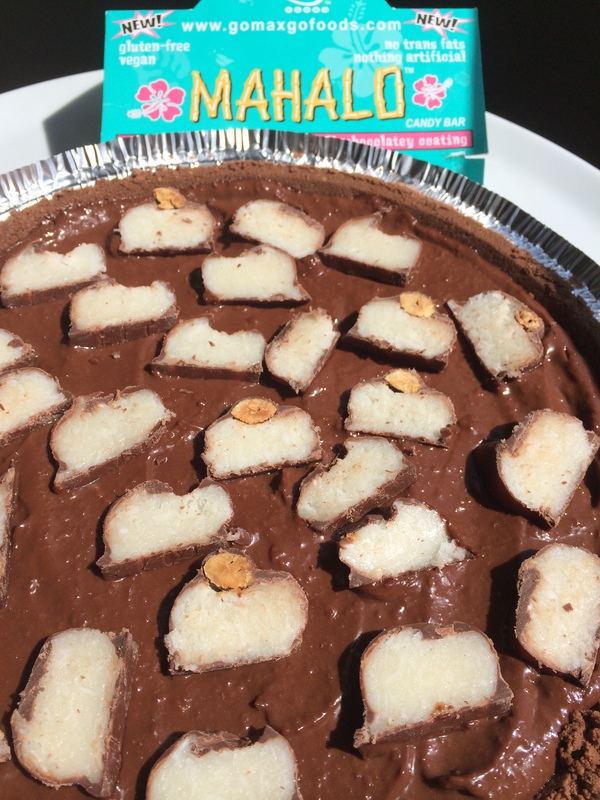 Have you made her Mahalo cheesecake yet? I heard it was pretty good, but what would a cat know about a cheesecake, huh? Did you enter our giveaway? My mom used a random number generator at www.random.org to pick this week’s winners. Stay tuned for some pawesome dog truffles recipe on Friday and a new giveaway! Easy as “no bake” (Mahalo) Pie!! Posted March 21, 2014 by GoMaxGo & filed under Uncategorized. Hello there, I am Elisabeth aka the Czech Vegan! 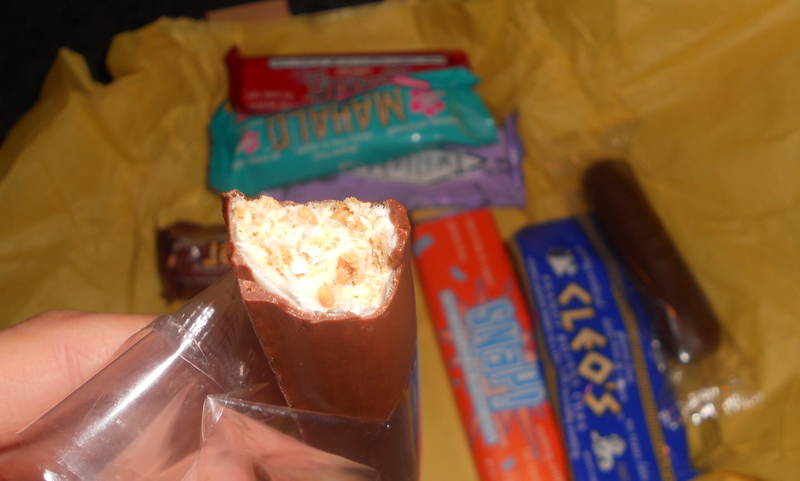 If you are reading this post, chances are that you are also a fellow chocoholic and a Go Max Go candy bars fan. Well, I am about to show you how to take Go Max Go experience into a whole new level. 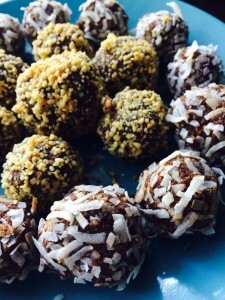 Are you ready for a vegan chocolate culinary adventure? Come with me to a chocolate paradise! I will be your tour guide for the next few weeks. You can look forward to some tasty recipes for humans and doggies. If you ever wanted to share your Go Max Go bars with your pooch but could not (since chocolate is toxic to animals), stay tuned for my doggie treats recipes that are safe for them. Let this adventure begin! 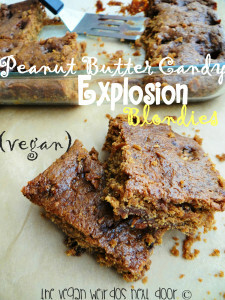 Here is a treat that will please vegans and non vegans alike. And the best part? You don’t need an oven to make this! 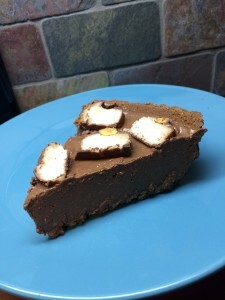 It is a no bake cheesecake 🙂 This cheesecake is decadent, rich and festive, yet it takes minutes to prepare. I love the combination of chocolate and coconut, in matter of fact, I love it so much, I even have some tea that is flavored like chocolate coconut. Mahalo bars are perfect for me since they are a combo of those two, plus some extra almonds. Melt chocolate chips in the microwave for 1 minute. Stir. Cook 20 more seconds and stir until melted. If it is not fully melted, cook 20 more seconds and stir some more. Place silken tofu in a blender or a food processor and blend until smooth. Add melted chocolate chips, powdered sugar, vanilla extract, maple syrup and shredded coconut. Blend again, scrapping sides frequently, until smooth and well blended. Pour mixture into graham cracker pie crust, spread evenly and smooth the top with a spatula. Garnish with Mahalo circles and refrigerate for several hours, until firm. Who wants to win FREE Go Max Go candy bars? We are doing a sweet giveaway and we will pick 2 lucky winners who will get 7 bars each. How great is that? And we are giving you multiple entry options so you have more chances to win. We will pick two random comments on Monday night (March 24th). On Tuesday, March 25th, we will announce the winners here on the blog, so stay tuned and check back here to see if you won. To enter this giveaway, comment bellow what is your favorite summer treat? For additional entries, post a link to this giveaway on Twitter, Facebook, your blog or Instagram, then comment bellow with a link to your post. You can do up to 1 extra entry per social media post per day. You can tag @GoMaxGoFoods and @CzechVegan in your tweets. Posted March 4, 2014 by Melisser & filed under Guest Blogger. Did you make a Twilight Tornado? A SNAP! Shake? How about a Buccaneer Blizzard? If so, we hope you enjoyed it as much as we did when we demolished ours! 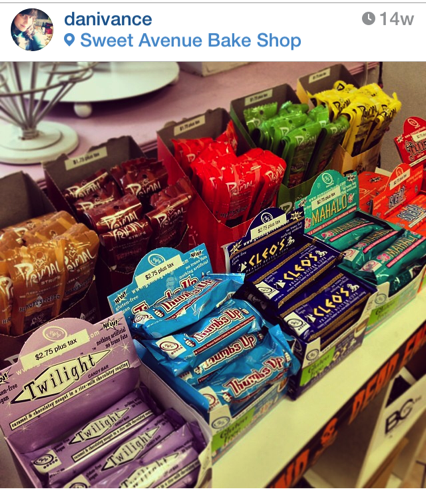 This week we’re giving a shout out to Sweet Avenue Bake Shop in Rutherford, NJ! Not only do they have awesome cupcakes I’ve had the pleasure of enjoying, but they also have Go Max Go candy bars. It’s a great place for allergies too, with gluten free and soy free options. 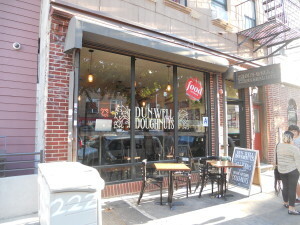 They’re not far from New York City, so if you find yourself in the area, be sure to stop by this 100% vegan bake shop! Each of the two winners will receive SEVEN Go Max Go candy bars.. that’s a lot of milkshakes! Congrats to Vegyogini & Katie G(lamour), email info@gomaxgofoods.com to claim your prize! My time blogging is almost up, but come back MONDAY, 3/10 for my final recipe and my biggest giveaway yet! Looking forward to sharing the extra tasty treat with you. Can you guess what candy bar will be used in my recipe? Posted February 28, 2014 by Melisser & filed under Guest Blogger. After hearing requests for Blizzards and Flurries from my last giveaway post, I thought I would give the public what they want! 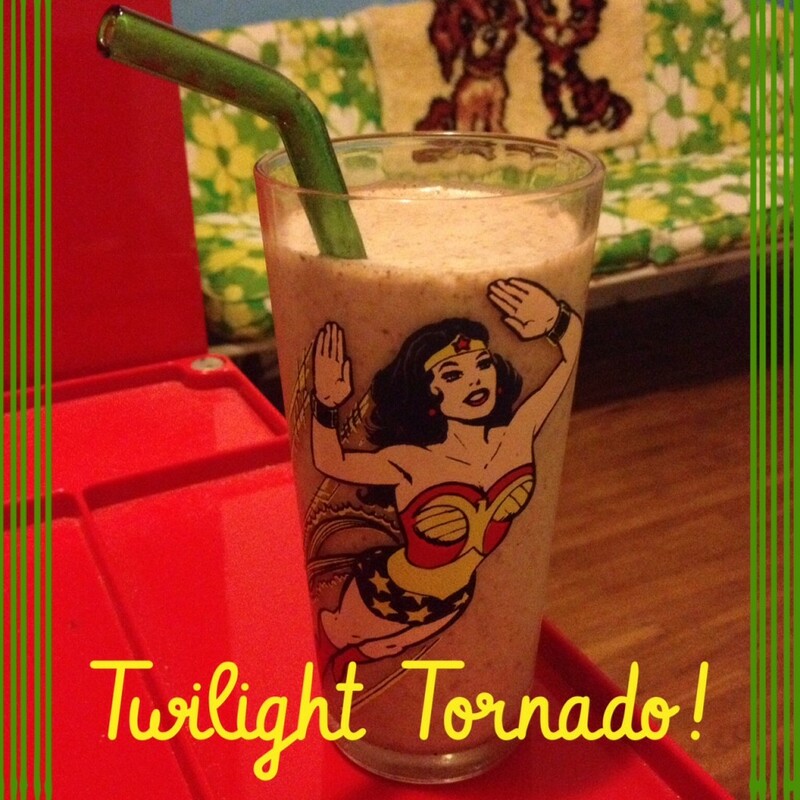 I’m calling this recipe a Twilight Tornado, but it could just as easy be a Mahalo Milkshake, a Buccaneer Blizzard, or a SNAP! Shake. Making the perfect milkshake can be tough to get right! Whether it’s too much liquid or not enough, the ratio is very important. Here’s my take on the classic shake! 1 Twilight bar or Go Max Go bar of your choice, chopped. 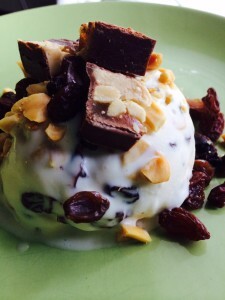 Put the ice cream and non-dairy milk in a blender and whirl until combined. It may take a seconds for the ice cream to really get blended, but DON’T add more liquid, it will work itself out! Add your chopped candy bar to the blender and pulse, until the candy bar is distributed throughout your shake and pieces are chopped to your liking. That’s IT! Super simple, rich, and delicious. Enjoy! Now, you know I’ve been the giveaway queen lately and that is STILL the case! Let’s keep the good times rolling with another sweet giveaway, this time to TWO winners, who will get one of each amazing Go Max Go Candy Bar! woo. There are TONS of ways to enter below, don’t miss out, winner announced Tuesday!